The wine industry should make it mandatory for all 21 year-olds to have at least one sip of a wine like this, for it’s guaranteed to turn them into serious wine lovers for the rest of their lives. 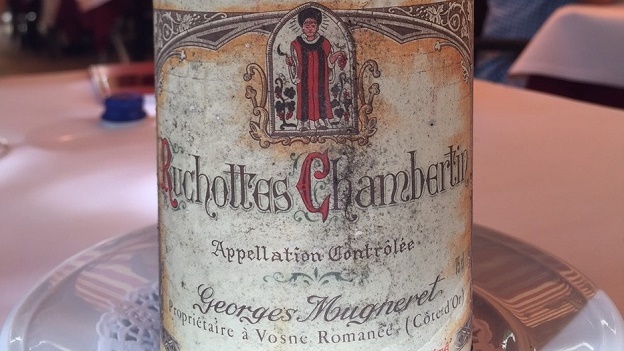 All kidding aside, it’s been a long time since I have had a better wine than the amazing 1985 Georges Mugneret Ruchottes-Chambertin. The minerally Ruchottes is also one of my favourite grand crus of all (the name Ruchottes derives from the word rocks), and in the hands of a talented producer such as Mugneret working a fantastic vintage such as 1985, greatness in the glass is virtually guaranteed. Mugneret-Gibourg’s parcel of vines (the second largest owner of Ruchottes) is located at the end of the Combe de Lavaux in what used to be more commonly referred to as Ruchottes du Bas; it was part of the Thomas-Bossot holdings that were divided up between Rousseau, Roumier and Mugneret when that domaine was sold. Mugneret’s Ruchottes is always suppler and sexier than most other Ruchottes that are sturdier and beefier. This 1985 is simply glorious, still bright red with very little amber at the rim, decadently endowed with aromas and perfumes of ripe red cherry, sweet raspberry nectar, Oriental spices and a hint of earthy stones. Vibrant and fresh, but with a velvety, luscious mouthfeel, only a hint of drying tannins on the long finish keeps this beauty from a perfect score. 98/Drinking Window: 2015-2025.